The mining industry faces some unique challenges when it comes to safety. Working conditions are often harsh, meaning the materials that are used need to stand up to vigorous demands. Fortunately, for the plastics industry, these unique challenges have offered a huge range of opportunities to develop parts and applications that enable safer environments and faster production. 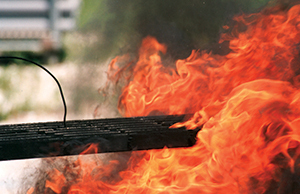 Whether the problem is cold or hot weather, abrasive materials, or the remote conditions, plastics distributors and fabricators, in partnership with their customers, have created solutions that have reduced maintenance, improved safety and extended the life of equipment for both open pit and underground mines. The following are just a sampling of some of the applications and products that have been developed for various metal (gold, uranium, etc. ), potash, and diamond mines as well as the oil sands. Trucks, tractors, shovels, conveyors, etc. are constantly being put through abuse by both the equipment operators and the materials being hauled or conveyed. As a result of this persistent wear and tear, parts and equipment are damaged and need frequent replacement, which increases operational costs as well as poses certain safety risks. When used in the mining industry, plastics are the perfect solution where sliding, rolling, abrasion, and impact are causing premature wear on equipment. 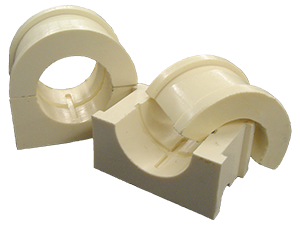 A variety of materials are available, such as polyurethane, that can absorb impact within structures as well as provide a barrier (bumpers/pads) for equipment parts that are striking one another. Others, such as polyethylenes (UHMW) are well suited as liners to protect costly equipment. There are also opportunities to replace OEM parts with longer lasting grades and formulations of plastic as well. Plastics that contain solid lubricant additives with high pressure velocity (PV) values and excellent wear resistance are specialty grades that are increasing in popularity. These plastic materials are used frequently for bushings and bearings and require no startup or running lubrication, which reduces periodic maintenance and lowers the overall cost of maintenance. Heavy-duty nylon conveyor rollers made of high-strength composite materials are also becoming popular due to their resistance to corrosion, abrasion and most importantly their FRAS (fire-resistant anti-static) properties for coal mines. Nylon rollers emit less noise and can be up to 60% lighter than equivalent steel rollers resulting in a less expensive part and quicker installation. Other applications include belt guides, rollers, sheaves, and pulleys. Traditionally these parts may have been steel; however, in comparison, plastic components are lighter weight and longer lasting, while reducing the wear and tear on the surrounding equipment. 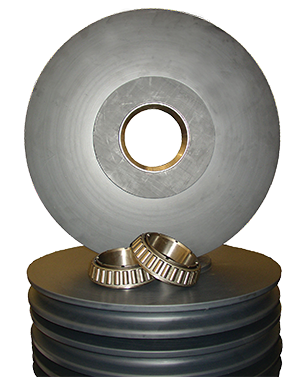 Cast nylon sheaves and pulleys require little to no maintenance, which means avoiding injury that is often associated with maintenance routines. Greg Ash, the General Manager for Xstrata Zinc, said that, “The safest mines are the most productive and most efficient.”1 In-line with keeping workers safe and reducing fatal accidents, a safe mine is also a productive one. It is because of this that mines must meet strict health and safety standards as a means to reduce the severity and frequency of accidents, minimize health hazards, and promote improved safety and health conditions within mines. In addition to this, if unsafe conditions are reported, insurance rates often skyrocket and investor attitudes may shift. Mining equipment is often very large, and the potential for injuries and fatal accidents is high if the necessary precautions and proper equipment are not used. Fire safety is also of supreme importance in underground coal mines. Industrial grade plastics have helped reduce the risk associated with mining activities significantly in several areas. In mines where coal dust, gas, fertilizer, or other combustible materials are involved, it is essential that the parts being used cannot create static electricity that can ignite the gases and dust in the atmosphere. Plastic materials that contain Fire Retardant Anti Static (FRAS) additives are a requirement for many parts and applications and are available as nylon rollers as mentioned earlier, as well as polyurethane parts, HDPE pipe, and anti-static dissipative UHMW, to name a few. Canadian, US, and International mining sites have similar specifications however learning the specifics from the MSHA (Mine Safety and Health Administration), Government of Canada and Canadian Standards Acts (CSA) or similar international organizations is best to be done upfront before engineering a new product or application. 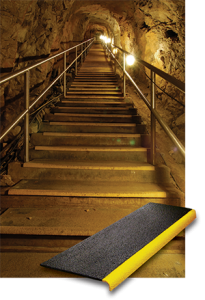 Another product that fosters safety for both underground mines and above ground mines is FRP (fiberglass reinforced plastic) grating. Grating material is used in a variety of mining applications such as walkways, stairs and structures because of its benefits over metal in that it is non-conductive, will not rust, is virtually maintenance free, and provides a safe, non-slip surface to walk. Phenolic grating also offers superior resistance to flame and high temperature with low emissions of smoke and toxic fumes. Clear or mirrored plastics such as polycarbonate also offer added protection to staff with 250x the strength of glass. 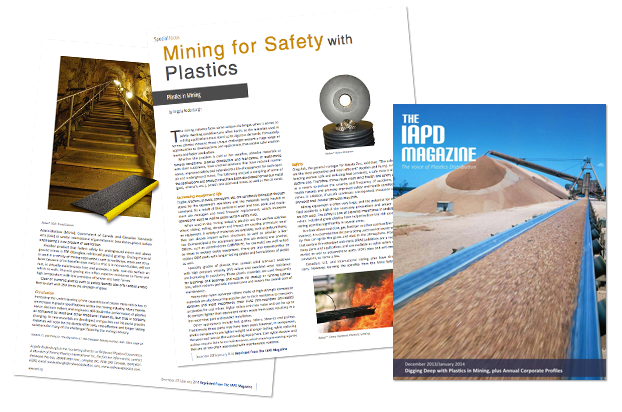 Increasing the understanding of the capabilities of plastic materials is key to an increase in plastic specifications within the mining industry. Many maintenance decision makers and engineers still doubt their performance next to steel and other traditional materials, but that is certainly changing. As new materials are developed, composites and industrial plastics materials will soon be the standard for safe, cost-effective, and longer lasting solutions for many of the challenges faced by the mining industry.